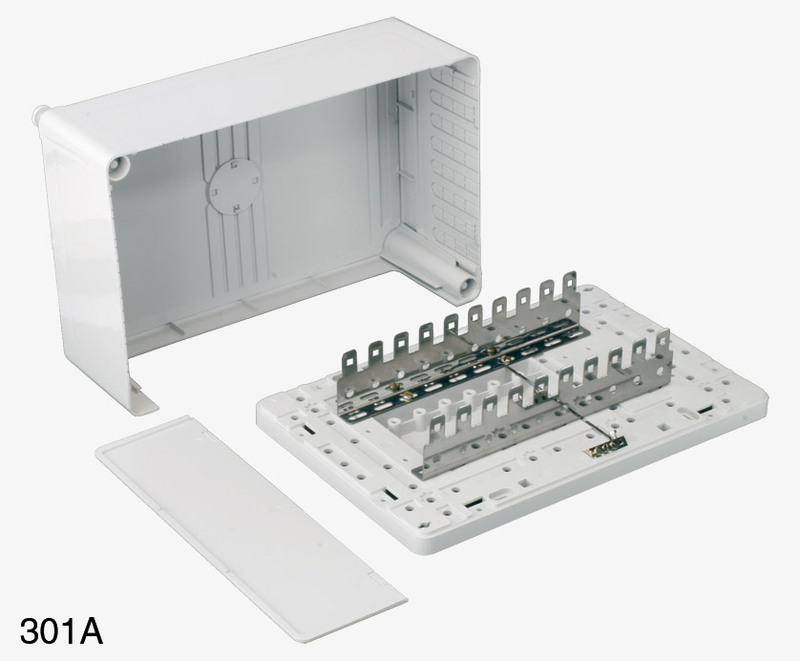 Ready made connection boxes offer a range of low profile to high density termination of cables in plastic housings with all the cable anchoring and cable entry requirements catered for. Larger boxes can be mounted together. Knock-out sections in the lids permit concealed interconnection of jumpers whilst retaining a neat appearance. 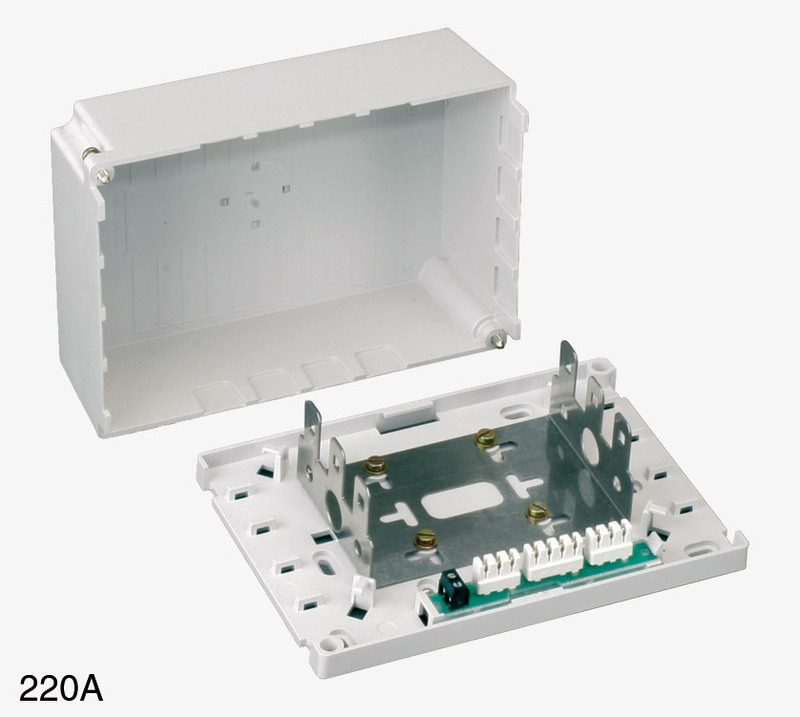 A low profile connection box containing 2 ×237A disconnection modules (20 pairs), earth strip, base and lid. Ideal for termination of cables in studios, intercoms, star points etc. 170mm ×120mm ×43mm. Fitted with a 3 module frame to accept 3 ABS/237 size modules (not supplied) and an earth strip, for 30 unscreened pairs or 18 pair + screens or combinations of both. Ideal for studio termination, microphone and tie line terminations, access points, star connections or where test access may be required. 170mm ×120mm ×80mm. 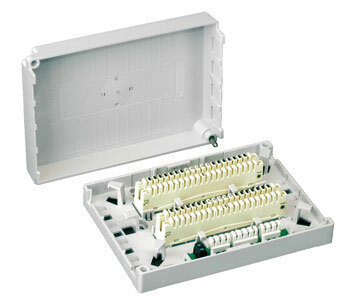 These are larger termination cases with space for 5 modules of the 237 or ABS size. The lids have removable side panels and knock outs for side by side mounting. The base is fitted with a screw terminal earth post and will accept a range of push-fit jumper rings and anchoring accessories. 160mm ×210mm ×90mm. 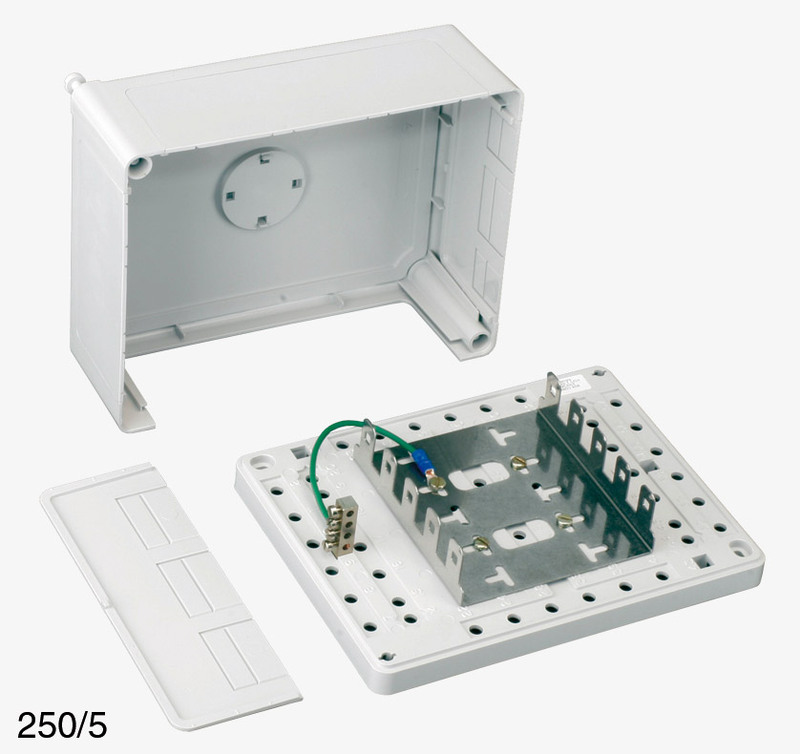 This offers larger capacity termination with backmount frame to accept 10 modules and screw terminal earth post. The quick release screw lid has knock out sections for joining several boxes together and the base can be fitted with a range of jumper rings and cable anchoring accessories. Suitable for termination of cables and equipment tails on walls, consoles or in areas where 19” rack space is not appropriate. 320mm ×210mm × 120mm. Optional base clamps to link adjacent boxes. Wallmount metal enclosure with hinged door. Accepts 34 modules, includes metal jumper rings. External dimensions 1000(h) ×300(w) ×140(d)mm. Wallmount metal enclosure with hinged door. Accepts 102 modules (3 rows of 34), includes metal jumper rings. External dimensions 1000(h) ×750(w) ×140(d)mm. Wallmount metal enclosure with hinged door. Accepts 136 modules (4 rows of 34), includes metal jumper rings. External dimensions 1000(h) ×1000(w) ×140(d)mm. Freestanding distribution frames can also be supplied for extra large applications where up to 2760 pairs can be terminated and jumpered, for cost effective alternative to rack mounted termination. 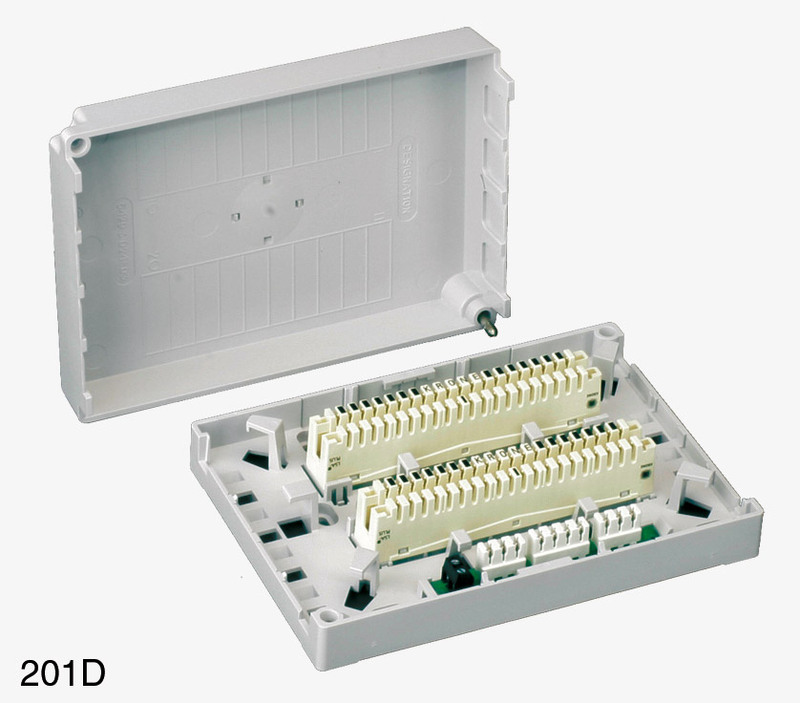 External cable termination is possible using weatherproof enclosures in units from 20 pairs to 1200 pairs.